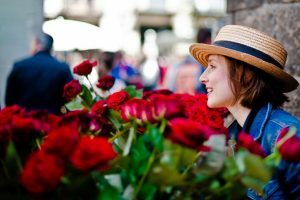 The Born is one of the favourite areas of many barcelonians: picturesque buildings, restaurants, shops, monuments and museums. Most of us we also know that it is a district of many contrasts as well. 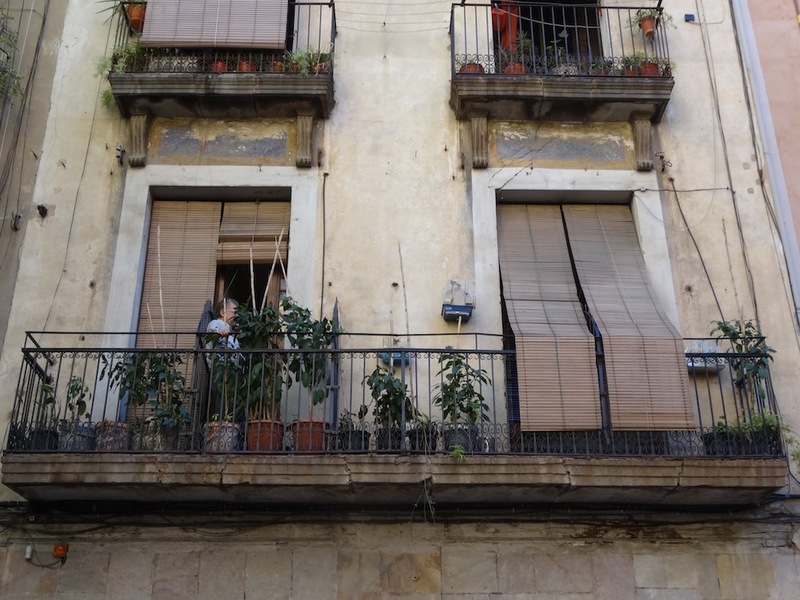 We cross Carrer Princesa and we enter the neighbourhood of Sta.Caterina where there are families without resources, immigrants and elderly people who live on their own. The Associació Solidaritat amb la Gent Gran, soon Fundació Roure, is carrying out since the beginning of the 90s a number of projects that give support to these groups. 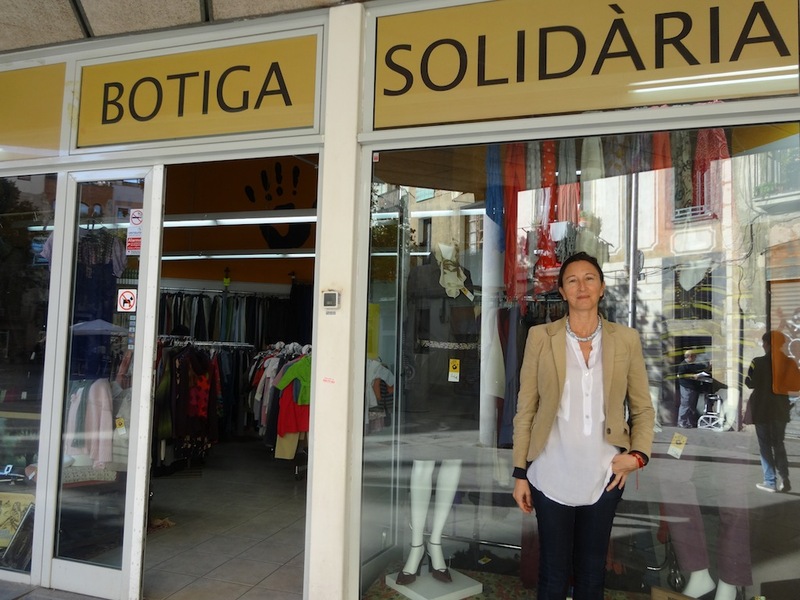 Today we speak with Carmen Litago (Barcelona, 1970), its fundraiser and responsible of the solidarity shop. 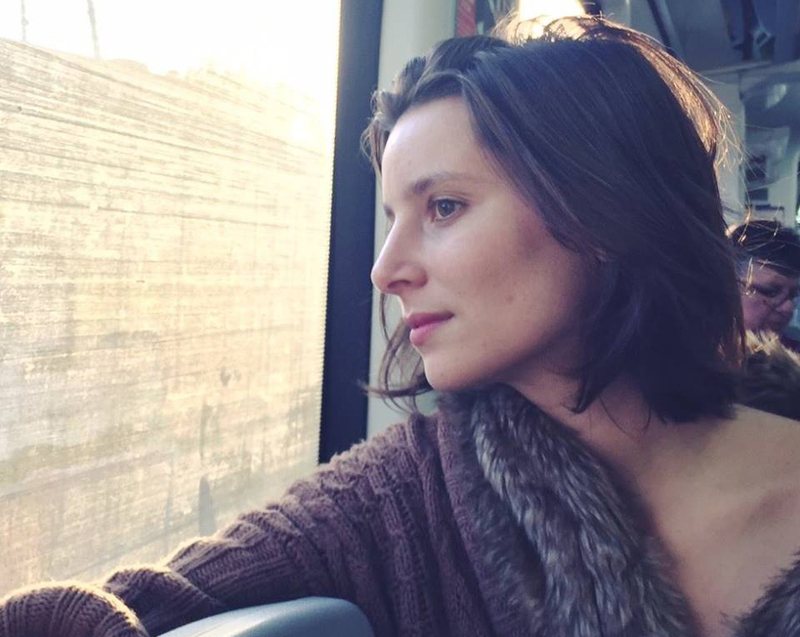 She explains us all the Fundació’s activities as she describes her every day work. After our conversation I become aware of a very uncomfortable reality: one that is also -very often- ignored. If you like, we can walk around this area while I show you everything we do. As you can see the Born, is a neighbourhood that many people who do not live here don’t know very well or they know it, but from a shopping and eating point of view. However, two blocks away from here, it is all very different. Like the Raval district, this is an area of many contrasts. There are 16th Century Palaces right by subsidized buildings. The Carrer Carders, Carrer Princesa o Montcada and some others are very popular, but very little is known about the nearby areas. That is true and it is why I would like to know more about what happens here. There is another side of the coin. Yes, this is one of the districts with more people over 75 who are living on their own. There are also many families here that have very little income or none. Could you please tell me, for example, about the work that The Fundació does with the elderly? Of course. We were born in 1992 as Foundation Prisba. The founder had a pharmacy near by and as she was selling her remedies, she was also watching their needs. At that time those who suffered the most where the elderly and families with various sorts of problems. So, after years of witnessing all these issues she wanted to do something: she decided to sell the Pharmacy and set up the Foundation with five projects that still continue today and now we’ve added more. Currently, the director is Llum Delàs and it is thanks to her energy and the energy of her team, that plenty of the most fragile people in the Casc Antic are being looked after. Nowadays the projects we are running are the following: a day centre for elderly people, a service of showers, a social canteen service, a project that sends professionals help the older people in their homes and Radars. The latter is all about collaborating with the people of the district, shops and neighbours that can detect if anything goes wrong. For example, some aged man who usually goes a certain day of the week to buy his groceries in a store, if suddenly he hasn’t showed up for a while, the store will alert us and we will check if he is all right. When we detect the needs that this person might have, we derive them towards the service that will be able to help him better. Before most of these activities were concentrated in a venue that the Ajuntament (Town Hall) ceded to us, in the Carrer Cecs de Sant Cugat. The problem of this place is that it has two floors and that does not meet regulations we needed in order to work with the elderly. So, this year we have moved to another place nearby, also owned by the city, where I am taking you now. And in at the original place, we still keep the showers, the social canteen and our offices. What do you do in a day centre for elderly people? Well, it is open Monday through Friday from 9 a.m. to 7 p.m. and weekends from 11 a.m. to 4 p.m. All the people who come here have families, but they have begun to show dementia or Alzheimer’s and cannot stay at home alone. So, their families bring them here. We have 15 volunteers, they do various activities and in the afternoon we take them back to their homes. Each person pays according to their own resources, if there are people who cannot afford it privately, the Town Hall helps them. There is room for 30 people in total, but at this moment there is 31 of them. There are 24 people working in all the Foundation and in particular at the day centre there are 12 professionals. Unlike other projects, it requires many more professionals and volunteers. ¿Qué se hace en un centro de Día para ancianos? From the outside it looks very nice, with all these pots of geraniums. Este está abierto de Lunes a Viernes de 9 de la mañana a 7 de la tarde y los fines de semana de 11 a 4. Todas las personas que hay dentro, tienen familias, pero empiezan a mostrar demencias o alzheimer y no pueden quedarse solos en casa. Y las familias los traen aquí. Tenemos a 15 voluntarios, hacen diferentes actividades y por la tarde los llevamos a sus casas. Cada persona paga su plaza en función de sus recursos, si hay personas que de manera privada se la pueden costear, lo pagan ellas, si no, el ayuntamiento ayuda. Tenemos 30 plazas en total, pero en este momento tenemos a 31 personas que viven por la zona. En toda la fundación hay 24 personas trabajando y, en concreto en el centro de Día hay 12 profesionales. A diferencia de otros proyectos, el centro de día exige tener a muchos profesionales además de los voluntarios. And the façade is impeccable. What is that logo at the door? The designer, Mariscal, lives in the area, I often used to see him around and, after chasing him for a while, we got him to donate this logo: it represents an oak, which gives meaning to the Roure Foundation: it gives this sense of joy, wisdom and shelter. He really made a logo that it is striking and that captures very well what we wanted to communicate to people. Lets go inside. Okay, I will still record the sound, but I will not take any pictures. Ok. Hi Dolors! Look, they are now making jewellery from recycled materials, they will sell their creations in our solidarity shop and with what they earn with the sales, they can go for an outing or for tea. They do several outings anyway: last week they went to the Tàpies Foundation. There are companies, such as the Fundación Telefónica, that subsidize them a visit somewhere. We also have volunteers of all kinds: some who are potters, others who organize memory workshops and with cans of soda there are now making some fantastic bracelets. Look. Yes. The truth is that they do lots of varied things and they are happy; have you seen the amount of natural light that we have? Thanks to public entities and private companies, we can finance all this. We also have food donated to us, I’ll show you the kitchen. Everything is very transparent, there are no secrets. The meals at the day centre and at the social canteen are both provided by a specialized catering who brings it to us. Especially the aged people’s food has to be controlled because of health reasons: hypertension, diabetes, etc. Look at the fridge: these yogurts, cookies or cheese, sometimes they are donated by large surfaces, other times they come from the food bank which distributes the third Thursday of each month. We are grateful for any little help we can get, not only for the day centre, but also for the home support project. In this area there are plenty of very small apartments without elevator and a very narrow staircase. Some elderly people who cannot go up and down, spend months without leaving their home. In this project, there are professionals who go to help them, to clean, to bring them their shopping, etc. I am responsible for the fundraising, I speak with companies and do awareness talks in schools, etc. The store helps us to finance all this too. I am taking you there now, everything is very close. Lets go. What kind of shop is it? You can basically find clothing for man, woman and children and footwear too. Then you can also find articles such as: crockery, books, home wear, complements, etc. It’s all second hand, but it is in a perfect condition. This shop started with the idea of offering people without resources the possibility of choosing their own clothing so they wouldn’t have to live out of charity only. Here you can choose what you want. Thanks to the selection of articles that we do and the person in charge of the store, Ana, the buyer’s profile has changed a lot. Right now 70% of our buyers are young people from abroad because perhaps here the second hand culture is not that popular, but in other countries it is. At an average price of € 4 a t-shirt, we sell about 100 pieces daily that are used to help us fund the Foundation. If you come with enough time to look carefully, you can find great pieces for every taste. Sometimes there are Marc Jacobs jackets for €15. We have even participated in some edition of the market Lost and Found. Up there is a sewing workshop. We alter items or, for example, we do different assignments that people requests. Manoli, what are you doing right now? (Manoli gets down of the mezzanine and kindly shows us a few bibs that she is making out of recycled fabrics). I have seen the day centre, the shop and workshop, you have told me about the support you provide for the elderly people in their homes. Could I see the social canteen and the showers? Yes, we are going there now. It is 13h, I guess there must be people eating already. Currently the canteen feeds about 41 people, but if all goes well, we want to duplicate the food turns. Before most of the people who came to eat were immigrants, but now there are also many disadvantaged local families. These canteens are usually for adult people, but in this one you can also find children, especially in non-school time. We do a follow-up of all those who come to eat here. It is very important to take care of everyone. There is a professional who is responsible for knowing their situations and tries to help them. In many cases it is all simply about employability. It’s very exciting when you find people who have not worked in two years, you give them clothes for the job interview: clean pants and a white shirt, they go to the interview and they are in. From there, they can start a new life. What kind of jobs do they get? They often get jobs within the hospitality industry, or in warehouses, it depends on each case. I see. Are you planning to develop any other activity? Yes, now we want to open a laundry to wash the clothes of the users of the day centre and of the people we support at their homes. Hopefully, if all goes well, we will also be able to wash the clothes of many other people. We also have the project of ‘work for the Community’s benefit’ which is an agreement that we have with the Ministry of Justice and with people who have to do work for the benefit of the community. We look very well at their profiles and they can come to help us on our projects: at the shop or the canteen. Another project is the ‘mutual benefit alliances’ where we do specific things. Every year we offer different ideas to companies or entities. 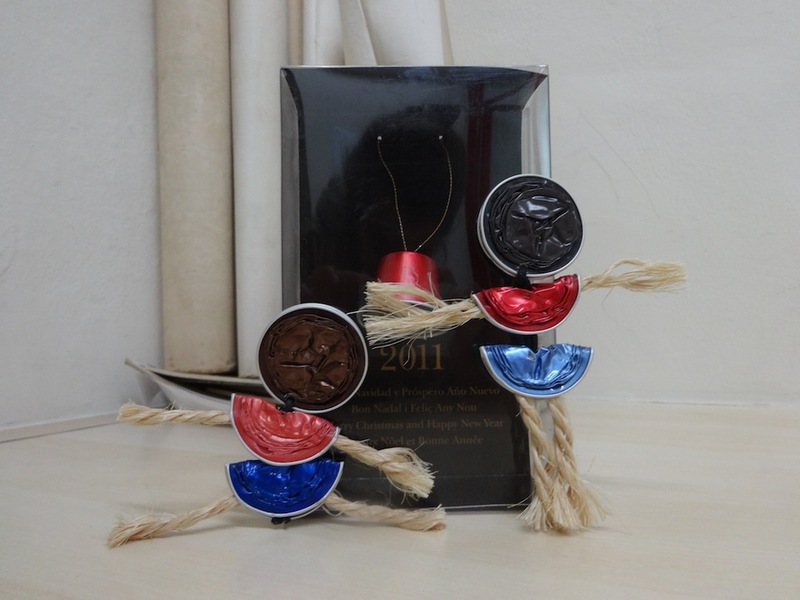 For example, in 2011, the day centre users and volunteers worked on a Christmas bell made with capsules of decaffeinated coffee or little dolls that the company buys from the Association and then gives to its customers or distributors. Now that Christmas is coming, we need toys in a good condition. Whoever wants to donate, here we are. Perfect Carmen. Thank you for everything! 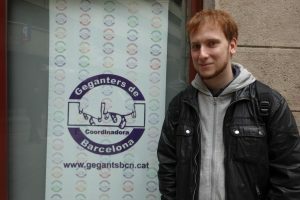 Associació solidaritat amb la gent gran. 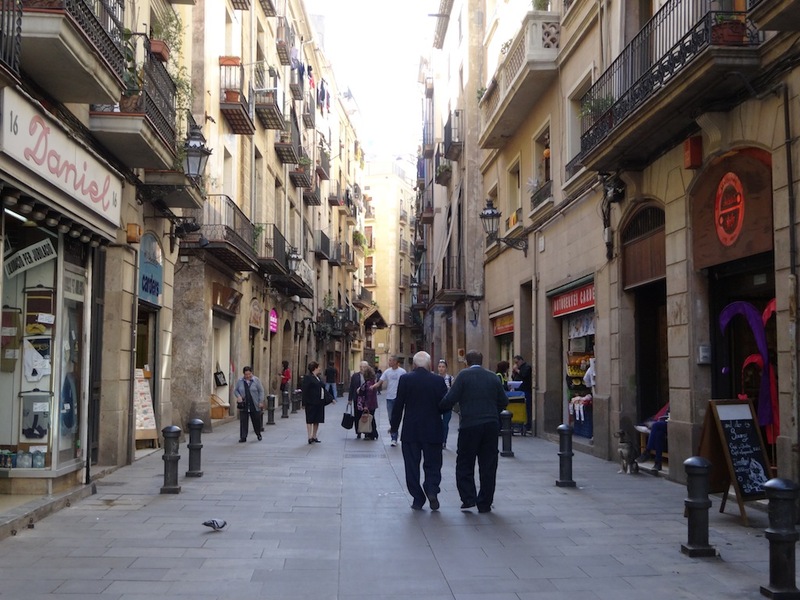 El Borne es una de las zonas favoritas de muchos Barceloneses: edificios, pintorescos, restaurantes, tiendas de moda, monumentos, museos… Muchos sabemos que es también un barrio de muchos contrastes. Cruzamos la Calle Princesa y entramos en el barrio de Sta.Caterina, donde existen familias sin recursos, inmigrantes y ancianos solitarios. La Asociación Solidaritat amb la Gent Gran, en breve Fundación Roure, lleva a cabo desde principios de los 90 una serie de proyectos que dan soporte a estos colectivos. Hoy hablamos con Carmen Litago (Barcelona, 1970), su recaudadora de fondos y responsable de la tienda solidaria, que nos cuenta todas sus actividades y cómo es el día a día en su trabajo. Gracias a ella, tomo consciencia de una realidad incómoda y, a menudo, ignorada. Si te parece, damos una vuelta por aquí y te voy enseñando todo lo que hacemos. Ya ves que el Borne es un barrio que mucha gente que no vive aquí desconoce o conoce, pero desde un punto de vista de las tiendas y los restaurantes, pero a cuatro calles de esto, todo es distinto. Como el Raval, es una zona de muchos contrastes. Tienes palacios del siglo XVI y al lado, viviendas de protección oficial. La calle Carders, Princesa, Montcada y algunas otras son muy turísticas, pero se conoce poco todo lo que hay justo al lado. Es cierto, por eso me gustaría mucho saber qué pasa por aquí. Hay otra cara de la moneda. Sí, este es uno de los distritos con más personas mayores de 75 años que viven solas. También hay muchas familias de aquí que lo están pasando mal. Y, por ejemplo, ¿cómo ayudáis a las personas mayores?. Te cuento. Nacimos en el año 1992 como fundación Prisba. La fundadora tenía una farmacia aquí al lado y a medida que iba atendiendo a la gente, también iba observando sus necesidades. En ese momento, las personas que peor lo pasaban eran personas mayores y familias con muchas problemáticas. Ella decidió vender la farmacia y crear la fundación con cinco proyectos que hoy en día siguen adelante, incluso ahora hemos añadido más. Actualmente, la directora es Llum Delàs, gracias a su fuerza y a la del equipo, se consigue atender diariamente a las personas más frágiles del Casco Antiguo. A día de hoy, los proyectos son: el centro de día para gente mayor, servicio de duchas, comedor social y un proyecto de atención a personas mayores en sus domicilios y Radars. Este último consiste en colaborar con la gente del barrio, comercios y personas que detectan si algo va mal o si por ejemplo, algún anciano que solía ir un determinado día a hacer la compra en una tienda, si de repente no va, se avisa y se comprueba que se encuentre bien. Cuando detectamos qué necesidad tiene, lo derivamos hacia el servicio que necesite. Antes, todas las actividades se concentraban en un local que nos cede el Ayuntamiento, en la Calle Cecs de Sant Cugat. El problema de ese local es que tiene dos plantas y eso no cumple las normativas para que vaya gente mayor, así que este año nos hemos trasladado a otro local cerca, todo planta baja y también propiedad del Ayuntamiento, donde te estoy llevando ahora. Y en el sitio original mantenemos las duchas, el comedor y nuestras oficinas. La verdad es que desde fuera se ve muy bonito, con todos estos tiestos de geranios. Y la fachada está impecable. ¿Qué es este logo que hay en la puerta? Mariscal, el diseñador, era vecino de la zona, yo le veía mucho y, a base de perseguirlo, conseguí que donara este logo. Es un roble, que da significado a la Fundación Roure: da este sentido de alegría, sabiduría y cobijo. Realmente hizo un logo que llama la atención y capta muy bien lo que queríamos transmitir a la gente. Vamos a entrar. De acuerdo, sigo gravando sonido, pero no hago fotos. Ok. ¡Hola Dolors! Mira, ahora están haciendo bisutería con material reciclado, luego las vendemos en la tienda y con lo que ganan las personas mayores del centro de día, a veces se van de excursión o a merendar. Igualmente hacen varias actividades, el otro día se fueron a la Fundación Tàpies, por ejemplo. Luego hay empresas, como la Fundación Telefónica, que les subvencionan la visita a algún otro lugar. También tenemos voluntarios de todo tipo: algunos que son ceramistas, otros que les hacen hacer talleres de memoria, y con las latas de refresco están haciendo unas pulseras estupendas. Mira. Sí. La verdad es que hacen cosas muy variadas y están a gusto, ¿has visto la cantidad de luz natural que tenemos? Gracias a entidades públicas y a empresas privadas, podemos financiar todo ésto. También nos donan comida, te voy a enseñar la cocina, aquí todo es muy transparente: no hay secretos. Tanto la comida del centro de día como la del comedor social, nos la trae un catering especializado. Sobretodo con los ancianos, hay que controlar mucho su alimentación por temas de salud: hipertensión, diabetes, etc. Mira en la nevera: estos yogures, galletas o los quesos. A veces nos los donan grandes superficies, otras cosas vienen del banco de alimentos que reparte el tercer jueves de cada mes. Toda ayuda es poca, no solo para el centro de día, está también el proyecto de apoyo a los domicilios. En esta zona hay pisos muy pequeños sin ascensor y con una escalera estrechísima, algunos ancianos, por no poder subir y bajar, pasan meses sin salir de casa. En este proyecto, hay ayudantes de domicilio contratadas que van a ayudarles: a limpiar, a llevarles la compra, etc. Yo soy la responsable de la captación de fondos, hablo con empresas, hago charlas de sensibilización en colegios, etc. Para financiar todo esto también tenemos la tienda. Ahora te llevo, está todo muy cerca. Vamos. ¿Qué tipo de tienda es? Básicamente se vende ropa de hombre, mujer y niño y calzado, pero también se pueden encontrar artículos como: vajilla, libros, ropa para la casa, complementos, etc. Es todo de segunda mano, pero está en perfecto estado. Esta tienda empezó con la idea de ofrecer a la gente sin recursos que vive por aquí la posibilidad de escoger su propia ropa, que no viviera solo de la caridad. Aquí puedes elegir lo que quieras. Gracias a la selección de artículos que hacemos y a la responsable de la tienda, Ana, el perfil de comprador ha cambiado mucho. Ahora mismo un 70% es mucha gente joven, extranjeros, porque aquí quizás la cultura del segunda mano no está muy implantada, pero en otros países es algo muy popular. A un precio medio de 4€ una camiseta, vendemos diariamente unas 100 piezas que sirven para ayudar a financiar la fundación. Si vienes con tiempo de mirar bien, puedes encontrar piezas fantásticas para todos los gustos. A veces hay chaquetas de Marc Jacobs por 15€. Incluso hemos participado en alguna edición del mercado Lost and Found. ¿Qué hay arriba en el altillo? He visto el Centro de día, la tienda, el taller, me has hablado del apoyo a domicilio. ¿Podría ver el comedor social y las duchas? Sí, vamos. Son las 13h, supongo que ahora habrá gente comiendo. Actualmente el comedor da de comer a unas 41 personas, pero si todo va bien, queremos duplicar el turno de la comida. Antes principalmente los que venían eran inmigrantes, pero ahora también hay muchas familias desfavorecidas de aquí. Normalmente este tipo de comedores están destinados a gente mayor, pero en este también se pueden encontrar a niños, sobretodo en época no escolar. Nosotros hacemos un seguimiento de todos los que vienen a comer. Es muy importante cuidar de cada persona. Hay una profesional que se encarga de conocer sus situaciones e intenta ayudarles. En muchos casos simplemente se rata de hacer inserción laboral. Es muy emocionante cuando encuentras a personas que no han trabajado en dos años, les das ropa para la entrevista de trabajo: unos pantalones limpios y una camisa blanca, hacen la entrevista y entran. A partir de allí ya pueden rehacer toda su vida. ¿Qué tipo de trabajos cogen? La mayoría suelen encontrar trabajos dentro de la hostelería, o en almacenes, depende de cada caso. Ya veo. ¿Está previsto desarrollar alguna otra actividad? Sí, ahora queremos abrir una lavandería para lavar la ropa de los usuarios del centro de Día y de las personas mayores que atendemos en el proyecto de ayuda en los domicilios. Ojalá, si todo va bien, también podremos lavar la ropa de más gente. También tenemos el proyecto de ‘Trabajo en beneficio de la comunidad’ que es un acuerdo que tenemos con el ministerio de Justicia y con personas que tienen que cumplir trabajo en beneficio de la comunidad. Miramos muy bien los perfiles, colaboramos con personas que tienen que cumplir unas horas de trabajo en beneficio de la comunidad y vienen para ayudar en los proyectos. Otro proyecto es el de las ‘Aliances en benefici mutu’ donde vamos haciendo cosas puntuales. Año a año ofrecemos diferentes propuestas a empresas o a entidades. Por ejemplo, en el 2011, los usuarios del centro de día y los voluntarios trabajaron una campanita de Navidad con cápsulas de café descafeinado colocadas hacia abajo como si fueran una campanita o monigotes que la empresa compra a la asociación y luego regala a sus clientes o distribuidores. Ahora que llega la Navidad, necesitamos juguetes en buen estado y limpios. Quien se anime a donar, aquí estamos. Perfecto Carmen. ¡Muchísimas gracias por todo! El Born és una de les zones favorites de molts barcelonins: edificis pintorescs, restaurants, comerços, monuments, museus… Molts saben que és també un barri de contrasts. Creuem el carrer de la Princesa i entrem al barri de Santa Caterina, on existeixen famílies sense recursos, immigrants i ancians solitaris. L’Associació Solidaritat amb la Gent Gran, en breu Fundació Roure, realitza des de principis dels anys noranta una sèrie de projectes que donen suport a aquests col·lectius. Avui parlem amb la Carmen Litago (Barcelona, 1970), la seva recaptadora de fons i responsable de la botiga solidària, que m’explica les activitats que es desenvolupen a la Fundació i com és el dia a dia a la seva feina. Gràcies a ella prenc consciència d’una realitat incòmoda i, sovint, ignorada. 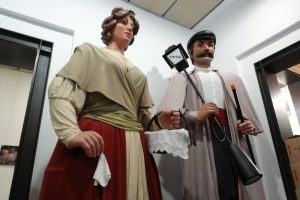 “A dos carrers del Born, existeix una realitat que molta gent no coneix”. Si et sembla bé, donem una volta per aquí i et vaig ensenyant tot el que fem. Ja veus que el Born és un barri que molta gent que noviu aquí desconeix, o bé el coneix des del punt de vista de les botigues i els restaurants, però a quatre carrers de tot això hi trobes una realitat molt diferent. Com el barri del Raval, és una zona de molts contrasts. Hi ha palaus del segle XVI i, al costat, habitatges de protecció oficial. El carrer dels Carders, Princesa, Montcada i alguns altres són molt turístics, però se sap poc de tot el que hi ha just al costat. És cert, per això m’agradaria saber què passa per aquí. Hi ha una altra cara de la moneda. Sí, aquest és un dels barrison hi ha més gent més gran de setanta-cinc anys que viu sola. També amb moltes famílies d’aquí que ho estan passant malament. I, per exemple, com ajudeu les persones grans? T’ho explico. Vam néixer l’any 1992 com a Fundació Prisba. La fundadora tenia una farmàcia aquí al costat i, atenent les persones, també veia quines eren les seves necessitats. En aquell moment, la gent que ho passava pitjor era la gent gran i famílies amb diversos problemes. Ella va decidir vendre la farmàcia i posar en marxa cinc projectes que avui en dia continuen, i encara ara n’hem afegit més. Actualment, la directora és la Llum Delàs. Gràcies a la seva força i a la del seu equip es poden atendre les persones més fràgils del Casc Antic. A dia d’avui, els projectes són: el centre de dia per a la gent gran, el servei de dutxes, el menjador social i Radars, un projecte d’atenció a la gent gran en els seus domicilis. Aquest darrer consisteix a col·laborar amb la gent del barri, els botiguers i les persones que detectin alguna cosa que no funciona. Per exemple, un ancià que solia passar a comprar en dia concret, si de sobte algú el troba a faltar, ens avisa i comprovem que aquella persona no tingui cap problema. Quan detectem la seva necessitat, la derivem cap al servei que necessiti. Abans totes les activitats es concentraven en el local que ens cedeix l’Ajuntament, al carrer de Cecs de Sant Cugat. El problema d’aquest local és que té dues plantes i no compleix la normativa per a gent gran, així que aquest any ens hem traslladat a un altre local que és tot planta baixa, a on t’estic portant ara, molt a prop d’aquí. També és propietat de l’Ajuntament. Ara, en el local d’origen, mantenim les dutxes, el menjador i les nostres oficines. Quines activitats es fan en un centre de dia per a gent gran? Aquest és obert de dilluns a divendres de nou del matí a set del vespre, i els caps de setmana d’onze a dues de la tarda. Totes les persones que s’hi estan comencen a mostrar demència o Alzheimer i no poden quedar-se soles a casa. Llavors, les famílies els porten aquí. Tenim quinze voluntaris; durant el dia tots fan diverses activitats i a la tarda els portem a casa seva. Cada persona paga la seva plaça en funció dels seus recursos. Si hi ha gent que es pot permetre, de manera privada, pagar-ho tot, ho fa. Si no, l’Ajuntament els ajuda. Tenim trenta places en total, però en aquest moment hi assisteixen trenta-una persones que viuen per la zona. Hi ha vint-i-quatre persones treballant a tota la Fundació, i en el centre de dia, en particular, hi treballen dotze professionals. A diferència d’altres projectes, el centre de dia requereix molts més professionals i voluntaris. La veritat és que es veu molt cuidat, fins i tot des de l’exterior: molt bonic, amb tots aquests testos de geranis. I la façana està impecable. Què és aquest logotip que hi ha a la porta? El Mariscal, el dissenyador, és veí de la zona. El veia molt per aquí i, a base de perseguir-lo, vaig aconseguir que ens fes la donació del logotip. És un roure, que dóna sentit a la Fundació Roure: aquesta sensació d’alegria, saviesa i refugi. Realment va crear un disseny que resulta sorprenent i capta molt bé el que volíem transmetre a la gent. Entrem. D’acord, encara gravo el so, però no faig fotografies. Perfecte. Hola, Dolors! Mira, ara estan fent bijuteria amb materials reciclats. Després la venen a la botiga, i amb el que guanyen poden fer alguna sortida o anar a berenar. Igualment, sempre fan diverses activitats. Per exemple, l’altre dia van anar a la Fundació Tàpies. Hi ha empreses, com la Fundació Telefònica, que ens subvencionen aquestes visites. També comptem amb voluntaris de tot tipus: alguns són ceramistes, altres fan tallers de memòria, o artistes que, per exemple, amb llaunes de refresc, els fan fer unes polseres fantàstiques. Mira. Sí. La veritat és que van fent activitats bastant variades i estan a gust. Has vist la quantitat de llum natural que tenim? Gràcies a entitats públiques i empreses privades podem finançar tot això. També ens regalen menjar. T’ensenyo la cuina: aquí tot és molt transparent, no hi ha cap secret. Tant el dinar del centre de dia com el del menjador social el porta un càtering especialitzat. Sobretot amb la gent gran, és necessari controlar la seva alimentació per causes de salut: hipertensió, diabetis, etc. Mira a la nevera: aquests iogurts, galetes i formatge, de vegades ens els donen les grans superfícies; altres vénen del Banc dels Aliments, que distribueix productes el tercer dijous de cada mes. Tota ajuda és poca, no només per al centre de dia, sinó també per al projecte de suport a les llars. En aquesta zona hi ha molts pisos petits, amb escales estretes sense ascensor. Algunes persones grans no poden pujar i baixar amb facilitat, i per això poden arribar a passar mesos sense sortir de casa. En aquest projecte hi ha ajudants a domicili contractats que van a ajudar-los per netejar, fer-los la compra, etc. Jo sóc la responsable de la recaptació de fons, de parlar amb les empreses i de fer xerrades de sensibilització a les escoles. Per finançar tot això també tenim la botiga. Ara t’hi porto, tot és molt a la vora. Anem-hi. Quin tipus de botiga és? Bàsicament s’hi ven roba i calçat per a home, dona i nen. També es poden trobar d’altres coses com: vaixelles, llibres, roba per a la casa, complements, etc. És tot de segona mà, però està en perfectes condicions. Aquesta botiga va començar amb la idea d’oferir la possibilitat de triar la seva pròpia roba a persones sense recursos que viuen per aquí, possibilitar que no només visquin de la caritat. En aquesta botiga pots triar el que vols. Gràcies a la selecció d’articles que fem i a l’Ana, la responsable, el perfil de comprador ha canviat molt. Ara mateix el 70% és gent jove, estrangera. Aquí potser la cultura de la segona mà no està gaire ben implantada, però en altres països és una cosa molt popular. A un preu mitjà de quatre euros per samarreta, cada dia comercialitzem cent peces i els beneficis s’utilitzen per ajudar a finançar la Fundació. Si véns amb temps per mirar bé, pots trobar coses per a tots els gustos. De vegades hi ha jaquetes de Marc Jacobs per quinze euros. Fins i tot hem participat en alguna edició del mercat Lost and Found. Què hi ha allà a l’altell? És un taller de costura. Retoquem vestits o els baixos de pantalons, per exemple, o realitzem diferents tasques que ens demanen. Manoli, què estàs fent, ara? Ja he vist el centre de dia, la botiga i el taller, i hem parlat sobre el servei de suport a la llar. Podriem visitar el menjador social i les dutxes? Sí, anem-hi. És la una del migdia, crec que ara ja hi haurà gent menjant. Actualment el menjador alimenta unes quaranta-una persones, però si tot va bé volem duplicar els torns. Abans principalment els que més venien eren immigrants, però ara també hi ha moltes famílies desfavorides d’aquí. Aquests menjadors solen estar destinats a persones adultes, però en aquest també s’hi poden trobar nens, especialment en èpoques no escolars. Fem un seguiment de tots aquells que vénen a menjar. És molt important tenir cura de tothom. Hi ha un professional que s’encarrega de conèixer les seves situacions i intenta ajudar-los. En molts casos simplement es tracta d’arreglar la seva situació laboral. És molt emocionant quan trobes persones que no han treballat en dos anys, els dónes roba per a l’entrevista de feina, uns pantalons nets i una camisa blanca, van a l’entrevista i entren. I a partir d’aquí, ja poden refer la seva vida. Quin tipus de feines acaben fent? Sovint troben feines dins de l’hostaleria o en magatzems, però depèn de cada cas. Ja ho veig. Teniu previst desenvolupar alguna altra activitat? Sí, ara volem obrir un servei de bugaderia per rentar la roba dels usuaris del centre de dia i de persones grans a qui donem suport dins del projecte de servei a les llars. Esperem que, si tot va bé, podrem rentar també la roba de més persones. D’altra banda, hi ha el projecte de Treballs en Benefici de la Comunitat, que és un acord que tenim amb el Ministeri de Justícia i amb persones que han de complir unes determinades hores treballant en benefici de la comunitat. Ens fixem molt bé en els perfils i algunes d’aquestes persones ens vénen a ajudar. Un altre projecte són les Aliances pel Benefici Mutu, mitjançant les quals anem fent col·laboracions puntuals. Cada any oferim diverses propostes per a empreses o entitats. Per exemple, el 2011, els usuaris del centre de dia, juntament amb els voluntaris, van fer una felicitació de Nadal amb càpsules de Nespresso posades com si fossin una campana, i també s’han fet ninots que l’empresa compra a l’Associació i dóna als seus clients o distribuïdors. Ara que el Nadal s’acosta, necessitem joguines en bon estat i netes. Qui s’animi a donar, aquí estem. Perfecte, Carmen. Gràcies per tot!